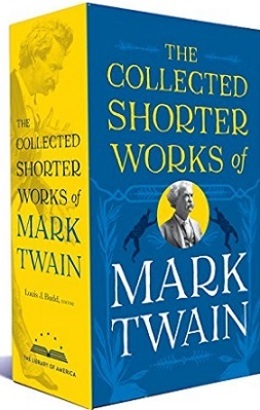 Although Mark Twain is best known for his uproarious humor and biting satire, “A Dog’s Tale” is a surprisingly sentimental polemic by an author who was “a longtime opponent of sentimentalism,” notes John H. Davis in the Critical Companion to Mark Twain. Twain may have composed this story at the request of his daughter, an opponent of vivisection—although his own hostility to the practice and his overall interest in animal welfare predate the story by many years. In any case, Twain scholar Shelley Fisher Fishkin acknowledges that by the beginning of the twentieth century Twain had become “the most prominent American author to inveigh against the practice of experimenting on conscious, unanaesthetized animals.” After the story’s appearance in 1903 in Harper’s, it was published as a pamphlet for the National Anti-Vivisectionist Society in Britain. The story was also issued in the United States as a hardcover edition (pictured above), with illustrations by W. T. Smedley, and included in the 1906 collection, The $30,000 Bequest and Other Stories. Among the tale’s clear influences is the poem “Tray,” by Robert Browning, which was also written in opposition to vivisection and relates a similar story. 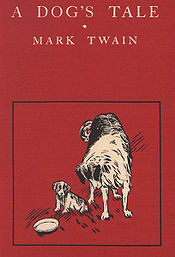 Some critics and readers have regarded Twain’s version in yet another light: as a parable about the evils of slavery, with the animals parodying “family separations, docile servitude, loss of identity, and roles as children’s playthings and guardians” (J. R. LeMaster, The Mark Twain Encyclopedia). Notes: Aileen Mavourneen, the hero-dog’s name, is the title of a popular ballad, with lyrics by the novelist Mrs S. C. Hall (Anna Maria Fielding Hall, 1800–81). The male dog’s name, Robin Adair, is also the title of ballad, this one by Lady Caroline Keppel (b. circa 1734); she wrote the song about her future husband, Robert (Robin) Adair. It was extremely popular in the nineteenth century and, in Jane Austen’s Emma, the character Jane Fairfax plays the tune on a pianoforte. This week’s selection was suggested by Kelly Nguyen from Pacific Northwest College of Art in Portland, Oregon. My father was a St. Bernard, my mother was a collie, but I am a Presbyterian. This is what my mother told me; I do not know these nice distinctions myself. To me they are only fine large words meaning nothing. My mother had a fondness for such; she liked to say them, and see other dogs look surprised and envious, as wondering how she got so much education. . . . If you don't see the full story below, click here (PDF) or click here (Google Docs) to read it—free!